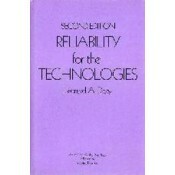 A unique volume, Reliability for the Technologies is designed to promote understanding of reliability's function in the achievement of safe, reliable technology. It represents one of the finest books yet published on this current and urgent subject, and it is of equal use to anyone involved on any level of technology product life. Uses four distributions to determine component reliability and confidence limits. Expands on the bathtub analysis to include two limits: design requirements and repair and maintenance. Shows the derivation the single-term binomial formula from basic probability theory.